Ilde Rizzo, Ph.D, is Professor of Public Finance at the University of Catania and former director of the Postgraduate Master on the Economics of Cultural Sector held by the Scuola Superiore of the University of Catania. She holds an honorary doctorate from the University of Buckingham, UK. She has published in many fields of public finance (Cultural economics, Performance measurement, Economics of Procurement, Health Economics) monographs and edited books, authoring also many refereed articles in professional journals and several other papers. Ilde has also coordinated national and international research projects in the field of cultural heritage. 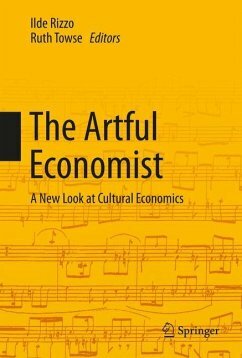 She is President elect of the Association for Cultural Economics International. She has given lectures, seminars and conference papers in many countries and has been consultant to national and international organisations. Ruth Towse is Professor of Economics of Creative Industries at the Centre for Intellectual PropertyPolicy and Management, Bournemouth University and CREATE Fellow in Cultural Economics (University of Glasgow). She specialises in cultural economics and the economics of copyright. She has published widely in both fields in academic journals and books and has also edited several collections of papers and original contributions. Ruth has been Joint Editor of the Journal of Cultural Economics, President of the Association for Cultural Economics International, and President of the Society for Economic Research in Copyright Issues and serves on the editorial boards of several academic journals. She has lectured and given seminars, conference papers and presentations to a wide range of organisations in many countries and has been consultant on cultural economics and the economics of copyright to a number of national and international governmental organisations. Introduction.- The Individual Choice-Public Choice Perspective and Cultural Economics.- Welfare Economics and Public Policy: A Re-examination.- Public Choice, Economics of Institutions and the Italian School of Public Finance.- Political Economy of Broadcasting: the Legacy of the Peacock Report on Financing the BBC.- The Public Spending for Culture in the Face of Decentralization Processes and Economic Recession: the Case of Italy.- Performance Rights in Music: Some Perspectives from Economics, Law and History.- Copyright and Music Publishing in the UK.- The Composer in the Market Place Revisited: the Economics of Music Composition Today.- Market Options and Public Action for Opera.- Towards More Innovative Museums.- Technological Perspectives for Cultural Heritage.- Archaeological Cultural Heritage: A Consideration of Loss by Smuggling, Conflict or War.- Theory and practice of cultural heritage policy.- On Judging Art and Wine.- Afterword.